What goes with a gold iPad Air 2? Give up? 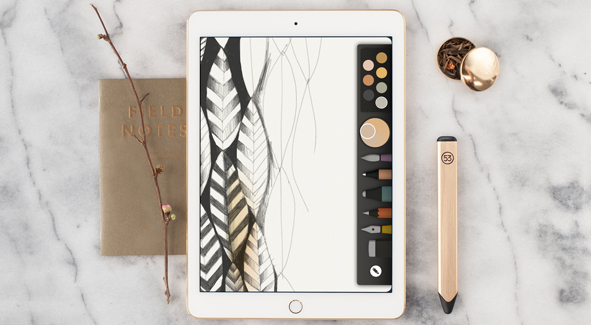 At least one thing would be FiftyThree’s new Pencil Gold, the latest addition to the company’s stylus line. Pencil Gold — from the company that invented the popular Paper mobile sketching and note-taking app — is the same Bluetooth Low Energy (BLE) stylus on the inside as its previously released Graphite and Walnut companions. But its exterior sports a brushed and anodized finish with a warm gold tone that’s deliberately designed as a accessory to Apple’s gold iPad and iPhone models. Pencil Walnut — released last year — is milled from a solid piece of sustainably harvested Wisconsin walnut. The stylus has a built-in lithium ion battery should last for about a month of normal use. While built specifically for its own Paper app, Pencil is also a serviceable stylus on any touchscreen device. In addition to FiftyThree’s involvement with both hardware and software creative tools, the company has also gone the collaborative route with its recently released Mix, an online platform that facilitates and encourages artistic viewing and collaboration. Pencil Gold is available for preorder now in the US and Canada for $59.95, and will ship on Tuesday, February 3. It is available from from FiftyThree’s website, Amazon and Apple stores. It works with the iPad 3, 4, and Air models and the mini.